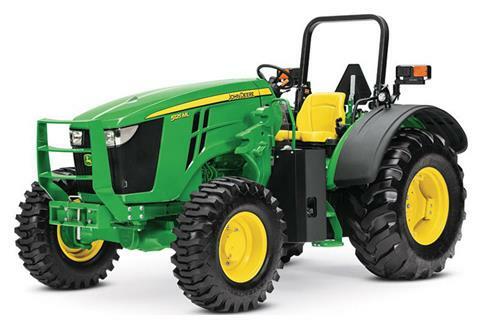 What makes 5125ML Specialty Tractor special? For starters it’s designed to handle all your low-clearance applications with a minimum height of 69”. Even better is reduced crop damage thanks to the 5125ML’s low profile and superior maneuverability that enables you to operate below produce, between trees and in tight spots. From there you have the ergonomic operator’s station with a right-hand console featuring SCV, hitch, PTO and throttle controls along with a handy declutch button for even greater ease of use. But what really stand out on the 5125ML are highest-in-class horsepower, pressureand-flow-compensated (PFC) hydraulic system and advanced cooling package. Of course you benefit from other improvements, too, like the larger fuel tank to limit trips to the pump and the field-installed JDLink™ for remote dealer monitoring to enhance performance and productivity. 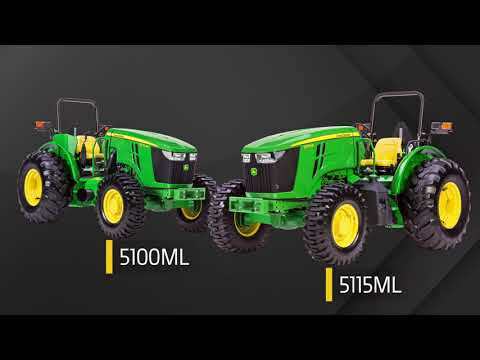 Take a good, long look at the 5125ML from John Deere for a special tractor experience that’s well suited for your nut, tree fruit or other specialty crop operation. Read on for more details. LOW-PROFILE STANDARD OPEN OPERATOR STATION (OOS): The standard OOS on 5ML Tractors was designed for low-clearance applications. It features a low-profile seat, a smaller-diameter steering wheel, protected controls, and a low-profile, rear-mounted rollover protective structure (ROPS). Combined with the sloping hood, this is beneficial to the operator’s visibility to the front of the tractor. Rounding off these standard features and incorporated into each operator platform is a shield which limits heat transfer from the hydraulics to the operator. POWRQUAD™ TRANSMISSIONS: The PowrQuad™ transmission can be ordered on any of the 5ML Tractor models with three different options to meet producer needs: 16F/16R PowrQuad, 16F/16R PowrQuad with creeper, or 32F/16R PowrQuad. These three transmissions options come standard with a 540/540 Economy/1000 power take-off (PTO) and are compatible with the pressure-and-flow compensated (PFC) hydraulic system. POWER BULGE AND TORQUE RESERVE PULL THROUGH THE TOUGH SPOTS: Putting more power to the ground translates to increased productivity in demanding conditions. Simply put, torque is the useable power that can be achieved. More torque leads to more lugging ability which helps the operator be more productive. 16F / 16R POWRREVERSER™ TRANSMISSION: The PowrReverser transmission provides 16F/16R speeds. This transmission comes standard with a dual-speed 540/540 Economy power take-off (PTO) and is ideal for applications requiring frequent directional changes. Low-profile standard open operator station (OOS).